The 2014 Together We Make Football campaign was a season-long initiative allowing NFL fans to submit videos, photos and essays sharing their love of football. Submissions were narrowed down to six finalists and NFL fans voted for their favorite individual and group entries. 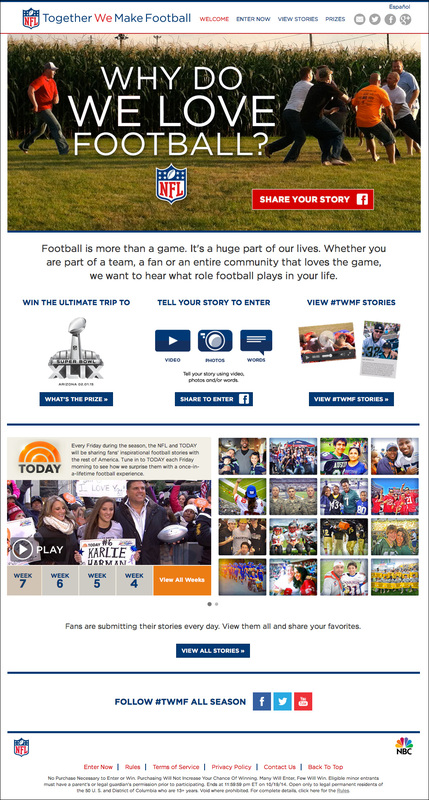 The winners were featured on the TODAY Show and awarded 2016 Super Bowl ticket packages. Pomp Productions was contracted by Team Digital to provide front-end and backend technical development for the project which included: Custom database development, video encoding, a custom CMS with content moderation and content sequenced to the 2014-15 NFL football season. The mobile responsive website was available in English and Spanish and included entry submission tools, video upload, searchable user content galleries and voting.